Gardeners who use synthetic chemical weed killers often find they do more harm than good. Residue left in the soil can inhibit or prevent future growth, and a small amount of powerful weed killer can drift onto other plants and damage them. Even natural or organic weed killers made with vinegar or essential oils can harm plants if they are used carelessly. 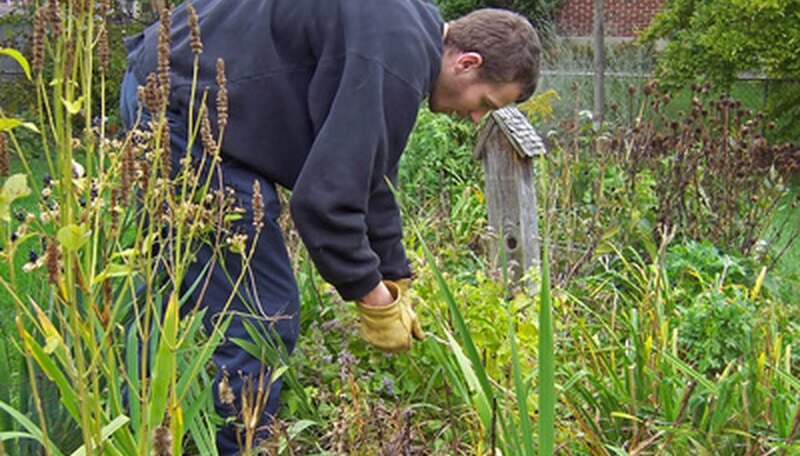 However, there are other ways to rid your garden of weeds without killing desirable plants. Although it may be work-intensive, hoeing is the safest and most effective weed killer. There is little chance of inadvertently killing desirable plants, and hoeing gets weeds out by the root, preventing re-growth. If you hoe when the weeds are small, you can also prevent re-seeding. Hoeing is also easier on your back than hand pulling, especially if you use a hula hoe (also called a stirrup hoe). This type of hoe has a moving ring at the end. With a gentle back-and-forth motion of your arms, the ring of the hoe goes under the weeds, uproots them and leaves them on the surface of the soil. On a dry, sunny day, the uprooted weeds wither and die and can be collected or left to feed the soil. Corn gluten meal is a byproduct of corn milling for food production. Also used as animal feed, this product is a safe pre-emergent weed killer that is effective on annual and perennial weeds. Corn gluten meal does not harm existing weeds or plants but instead inhibits existing seeds from sprouting. The University of Minnesota Extension Service recommends applying corn gluten meal to lawns in midspring and late summer. The spring application should kill off most annual weeds, and the summer application takes care of many perennial weeds. It can also be used in gardens around perennials and established seedlings. It should not be used on newly seeded lawns or gardens, however, because it will prevent the seeds from sprouting and growing. A flamer is a weeding tool that runs on propane or paraffin. It shoots an extremely hot and highly concentrated flame that causes the water inside of the weeds to boil and destroys their cells. The flame is often hot enough to destroy the root as well. Flamers also destroy any seeds inside the plant and on the ground nearby. This type of weed killer is especially effective on driveways and between rocks and paving stones and can even be used carefully near established plants as long as the flame doesn't touch them.